1- Make sure you have the latest version of Beauty Box. We’re constantly tweaking it to make the GPU support better, so get the latest version FOR MAC or FOR WINDOWS. 4- We recommend Nvidia cards. Partially because of Apple’s poor AMD driver. So it’s not all AMD’s fault, but overall we’ve had a lot more problems with AMD cards than Nvidia. Both on PCs and Macs. 5- Restart the app and computer. If you’ve been working for a while, and there are multiple apps/plugins using the GPU, you can start making the app and system unstable. If the problem cropped up out of nowhere, a system restart may be in order. Save the file and retry Beauty Box. 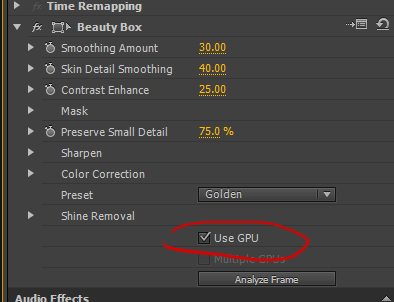 7- Use After Effects to do the rendering. AE makes the best use of multi-processing of any host app we’ve seen. Since it’s using multiple processors, the GPU plays less of a role. The more regular processors you’re using, the less the GPU matters. The editing apps like Premiere and FCP are not as good (or fast) at handling render intensive projects. They’re designed for editing speed, not rendering speed. GET SUPPORT: If you’re still having problems, please email us at sales@nulldigitalanarchy.com. You can also call at 415-287-6069, but you may get a faster response emailing us, as we’re not always in the office. Previous PostCreative Cloud from a Software Design PerspectiveNext PostIt’s a 4K World! … or not. I can use for a minute or less usualy before it crash. I really don’t know what to do, I already tried to change the settings to off. It was working before but since few weeks, it’s not working anymore and the program always crash.. Sorry, the blog wasn’t sending notifications about comments and I didn’t see this. If this is still happening or you need other tech support, please email sales@nulldigitalanarchy.com.